ARCATA – The irascible yak herders who have roamed Arcata’s streets with their hooved companions are no stranger to arguments, but fussing with passersby turned to jousting with tree branches during a clash with a bicyclist last week in the Community Forest. Tom Vanciel and Samuel Sanchez have not had an easy time in Arcata. The two are well-known on the streets and in local media for trekking about town with their “holy” animal companion yaks. Encounters with citizens are often tense to outright argumentative, and calls to police are common. The two frequently find fault with the manner in which their animals are greeted, and freely dispense caustic assessments of the ethical and spiritual values of those they meet. A succession of arguments with citizens in the Co-op parking lot led to the two being banished from there on pain of trespassing. The yaksmen have also been asked not to hang out in the Wildberries Marketplace after a complaint. Recently, the usual verbal strife turned physical. On Friday, Aug. 9, Vanciel reported an assault on the street by youths, but details are scanty. Apparently there was no lasting injury, and no suspects were identified or apprehended. At that time, he blamed this newspaper’s coverage of past arguments for the alleged attack. “I feel your cavalier reporting on these real issues has made it sport to harass and denigrate,” he wrote. On Monday, Aug. 12 at 4:03 p.m., Vanciel called Arcata Police from Trail One in the Arcata Community Forest. He reported an assault by two bicyclists who, he claimed, deliberately slammed into the two with their bikes, then followed up with fists. A cell phone video Vanciel posted on YouTube, titled “Just assaulted by this man,” shows a young man brandishing a large branch at the two. The antagonists exchange epithets, then the man briefly engages in fencing with Sanchez who is also wielding a tree limb. The man then grabs his bike and flees as Sanchez flings a large branch at him. An APD dispatcher log entry documents the police response. Officers searched for the alleged assailants, but didn’t locate them. Vanciel claimed to have sustained a concussion and broken jaw in the clash. with pain for days afterward. In a lengthy e-mail message, he describes the forest incident and aftermath, including unsatisfactory medical treatment. Vanciel, who speaks of past experience as a military intelligence officer, is disturbed by the government’s past and present activities with regard to suppression of the citizenry. He often refers to Bradley Manning and Edward Snowden, sometimes likening his situation to theirs. He suspects that the government may be sending him a message with the negative encounters. 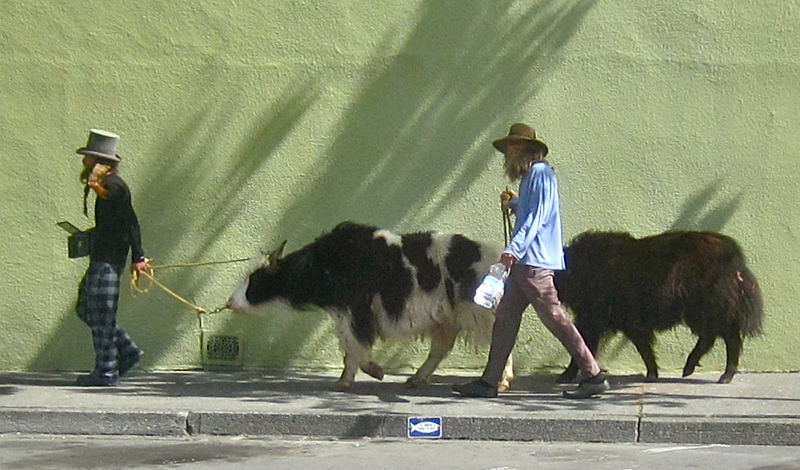 Saturday, in an e-mail message titled “Yaks for sale,” Vanciel suggested that he may be leaving Arcata. “Very sore from my beat downs and after a good birthday inventory and assessment, I feel I should disappear,” he wrote. In follow-up discussions, though, he seemed ambivalent about leaving, and said he would discuss matters with Sanchez. Meanwhile, Vanciel wishes to address the negative image he and Sanchez have recently gained. This entry was posted on Monday, August 26th, 2013 at 6:15 pm	and is filed under News, Animals, Environment. You can follow any responses to this entry through the RSS 2.0 feed.